Since starting as a research project in 1996, Google has evolved with roughly 500 improvements every year such as universal results, quick answers and Google Instant. "Our goal is to get you to the answer you’re looking for faster and faster, creating a nearly seamless connection between your questions and the information you seek," Google Fellow Ben Gomes writes on the Google blog. "That means you don’t generally need to know about the latest search feature in order to take advantage of it— simply type into the box as usual and find the answers you’re looking for." Google started based on the Page Rank algorithm but as more content surfaced on the web, it became increasingly hard to find the content you wanted, Ben says in the video. "As Google got better and better, users expected more and more from it," Google VP Marissa Mayer says. "They didn't want just web pages. They wanted the best possible information available, be that a picture or a book. So we started looking at how we could search new and other forms of content and image search was one of the first of those because we know that a picture's worth a thousand words." Google started to explore how they could search other forms of content and image search was one of the first. "We got a search, 'what is turquoise?' and there's no way to answer that question without a picture," Marissa says. Universal search returns results like images, videos, webpages and news to help people find any kind of content they're looking for. Before Sept. 11, 2001, however, Google did not have a news section, which made it hard for people to find content relating to the events of 9/11 since they had crawled the index a month earlier. "When September 11th happened, we as Google were failing users," Ben says. In an attempt to quickly remedy the situation, Google added links to its homepage from major news sources like CNN and the New York Times. In 2003, Google added quick answers, located at the top of the search results, for topics including flight times, sports scores and weather. "It’s been exciting to be part of the evolution of search over the past decade, and we’re thrilled about what’s in store next," Ben writes. "If the past is any indication, we don’t know what search will look like in 2020, but we wouldn’t be surprised if it looks nothing like it does today." 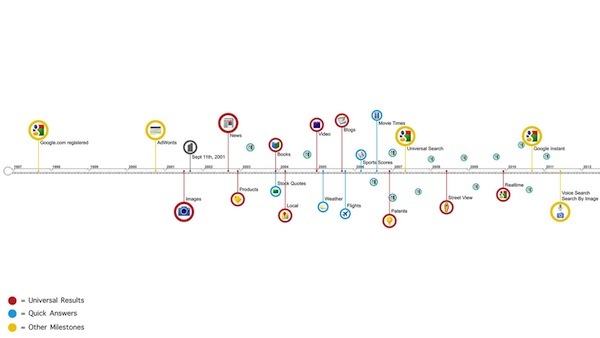 Click here to see the timeline of Google Search.